Forfar Athletic chairman Alastair Donald has conceded he has no solution to the recent spate in flares and smoke bombs being thrown by supporters. 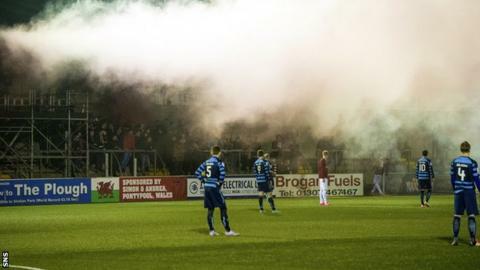 A number of smoke bombs were thrown onto the field marring Forfar's abandoned Scottish Cup replay against Linlithgow Rose on Tuesday night. "I'm not entirely certain Scottish football can do anything to eradicate it," Donald told BBC Scotland. "These tiny missiles that are coming in are the size of a cigarette lighter." The fourth round replay was cut short due to floodlight failure at Station Park, with a "distraught" Donald stating he had not anticipated any trouble or pyrotechnics from supporters. "Had this been a higher profile game, we would probably have put measures in place," he said. "But because we'd already played once and it went off absolutely seamlessly, you do your risk assessment and we thought we had the adequate amount of cover. "We possibly could have handled it better and maybe we should have been more prepared, but I think when you sit down, do your analysis of the facts before the game, this is probably as low-risk a game as you could get. The 42 SPFL member clubs met on Tuesday, with facial recognition technology mentioned as one potential method of identifying fans engaging in antisocial behaviour. "I'm open to suggestions from people - how would you control it?" added Donald. "If you've got 500-600 people in a contained environment and they're hell-bent on setting a flare off, you would need to have a steward for every three or four spectators to stop that, and that's never going to happen. "It's really regrettable and it's something that is happening more and more often. It's a wider problem that's becoming far too prevalent." Linlithgow Rose manager David McGlynn said the club would try to track down those responsible for throwing the smoke bombs, while club president Les Donaldson attempted to challenge the perpetrators at Station Park. "It's just shocking to think that a club who has tried so hard to go forward, to make facilities so good for every person who comes along to eventually be brought down by a bunch of hooligans who have no interest whatsoever in watching football, all they were there for was causing trouble," Donaldson told BBC Radio Scotland on Wednesday. "All I wanted to do was try to show solidarity with the stewards and the police and try to get these people to realise how they were letting a club down that has never been in any trouble before. "To be faced with this bunch of morons last night - they are not true Linlithgow supporters - we are just at a loss what to do." Should Scotland follow Czech route?